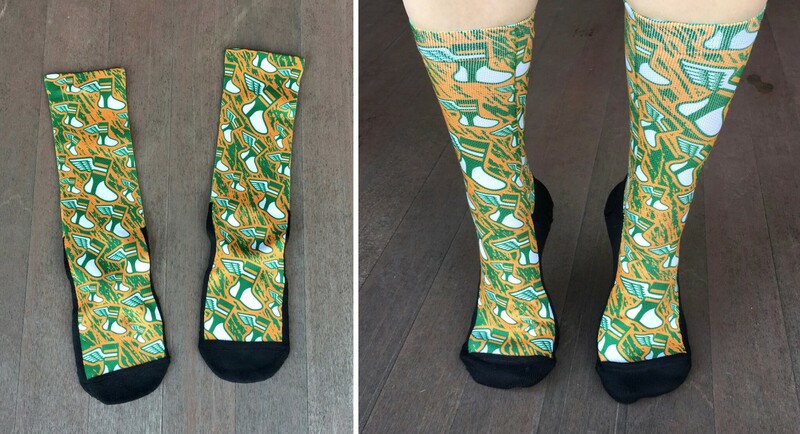 Our Uni Watch socks are made by Rock ’Em Socks, who’ve been great to work with. If you want a pair, the price is $13.99 plus $3 shipping, so the total is $16.99. If you want two pairs, the shipping is $5, for a total of $32.98. If you want three pairs, the shipping is $7, for a total of $48.97. If you want more than three pairs, get in touch and I’ll quote you a price. 1. Send the appropriate payment to me. I accept Venmo (use @Paul-Lukas-2 as the payee), Zelle (use plukas64@gmail.com; if you’re not familiar with Zelle, your bank’s website probably offers it under “Payments” and/or “Transfers”), Apple Pay (718-915-4943), or the Cash App (plukas64@gmail.com). Sorry, I can’t accept PayPal (a long, annoying story). If you prefer to send a paper check, money order, or well-concealed cash, get in touch and I’ll tell you where to send it. 2. After sending payment, please email me with your shipping address. Kudos to Harrison Hall and Brad Stafford at Rock ’Em Socks for making this happen, and my thanks to everyone, as always, for considering our products.